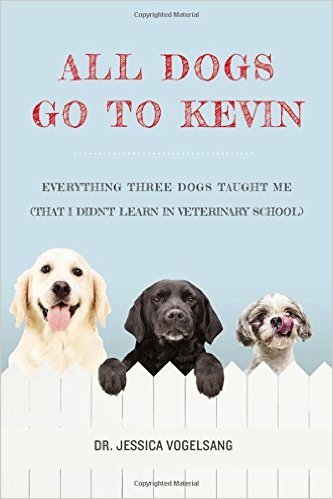 "All Dogs Go To Kevin": Review And Giveaway! We couldn't be more excited to have this opportunity to tell you a little about a wonderful book: All Dogs Go To Kevin, Everything Three Dogs Taught Me (That I Didn't Learn In Veterinary School), by Dr. Jessica Vogelsang, and to give away a copy to one lucky reader. Please know that we have received one hardback copy of this book and one to give away to our winner. We have not been otherwise compensated for writing this post, and rest assured our opinions about All Dogs Go To Kevin have not been swayed by two free copies! See how to enter at the end of this post! Parental Unit was lucky enough to chat with the author, Dr. Jessica Vogelsang, on a shuttle from the airport to a BlogPaws Conference a few years ago. She remembers that "Dr. V", (a nickname that her clients who couldn't pronounce "Vogelsang", gave her) was friendly, super smart and funny, qualities that shine through in this charming and witty memoir. O.K. Parental Unit thinks this book is more than "witty"—it's fits into her "wildly funny" category—Dr. V.'s self-depreciating humor coupled with hilarious descriptions of, well, just about everything, make all of her stories a joy to read. How many women do you know compare their dog (who had just emerged from eating a box of powdered sugar) to "Al Pacino after a coke binge in Scarface"? I thought so. Here's a picture of Dr. V. and canine friend. Dr. V., her husband, their two young children and a series of goofy, lovable dogs let us into their world and demonstrate the importance of family and friends—including the canine variety—in enriching our lives. But you'll also learn about what it takes to get through veterinary school and to practice veterinary medicine in a clinic setting, including the array of clients, both lovable and...well, not so lovable, whose pets she tends with great care. Dr. V. is also a superb writer, by the way, who's easy-going style draws you right into the action. When she learned that her dog, Emmett, had lymphoma, she stated simply: "We teach our dogs to "stay", but they never do." Parental Unit particularly loves Dr. V.'s poignant epilogue, where she vows to honor her dogs, past and present by "...striving just a little more to live like they did: with joy, unabashed and open, reminding myself and others that our flaws do not make us less, but ever more worthy of being loved just the way we are." We can learn so much from our pets, and All Dogs Go To Kevin helps show us the joy they bring to our lives, and how we can make sure we give them joy in return. 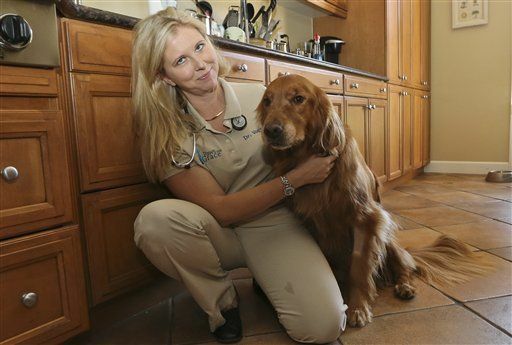 Dr Vogelsang's current veterinary practice provides in-home hospice care for dogs and cats. 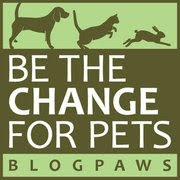 She's also founder of the website Pawcurious.com, and we can't recommend it highly enough. We're thrilled to bring you the opportunity to win a copy of All Dogs Go To Kevin, by entering the Rafflecopter giveaway below. Potential winner limited to the continental United States. Void where prohibited. Not entering because I was also lucky to have had the opportunity to read and review Dr.V's book a few weeks ago. I am just stopping by to say how FABULOUS this book is and how deeply touching it is as well. 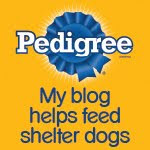 It totally humanizes Veterinarians as well and is an eye-opener about some clients too!!!! Good luck to all who enter, this BOOK is a WINNER! Sounds like a great book! I'm entering. I love books and I would love to read this one. Would like to win, thanks! I follow Dr. V's blog, so I would love to win this book. Thanks!